Ngakma Nor’dzin has been involved with healing for many years. In the 1990s she became a practitioner of Tibetan Energy Balancing, and also qualified as a reflexologist and as a homoeopath. Pulse diagnosis is an integral part of Tibetan Medicine, which is one of the world’s oldest surviving medical traditions. 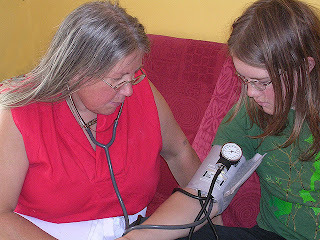 In the Aro Lineage system of energy balancing, imbalance at the elemental level is assessed through listening to the sound of the pulse, using a stethoscope. Based on this diagnosis, advice is offered with regard to adjustment to diet and lifestyle. Therapeutic treatment may also be given in the form of massage and elemental pills. Nor'dzin also offers guided relaxation sessions which include breathing exercises, movement, and other relaxation techniques. Each session also includes self-healing methods using visualisation, mantra and touch. Nor’dzin offers these therapies from Aro Ling Cardiff, the Buddhist Centre in Whitchurch Village, Cardiff. She donates the therapy fee to the charitable aims of Aro Ling Cardiff. Sessions start from £10. Please contact her for more details or to book an appointment.